Over the past few decades, research on metaphor has focused almost exclusively on its verbal and cognitive dimensions. 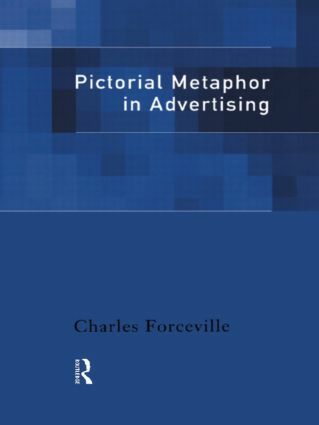 In Pictorial Metaphor in Advertising, Charles Forceville argues that metaphor can also occur in pictures and draws on relevant studies from various disciplines to propose a model for the identification, classification, and analysis of 'pictorial metaphors'. By using insights taken from a range of linguistic, artistic and cognitive perspectives for example, interaction and relevance theory, Forceville shows not only how metaphor can occur in pictures, but also provides a framework within which these pictorial metaphors can be analyzed. The theoretical insights are applied to thirty advertisements and billboards of British, French, German and Dutch origin. Apart from substantiating the claim that it makes sense to talk about `pictorial metaphors', the detailed analyses of the advertisements suggest how metaphor theory can be employed as a tool in media studies. Context in its various manifestations plays a key role in the analyses. Furthermore, the results of a small-scale experiment shed light on where general agreement about the meaning of a pictorial metaphor can shade over into other more idiosyncratic but equally valid interpretations. The final chapter sketches the ways in which the insights gained can be used for further research.